We love Converse trainers. We especially love Converse trainers with prints. We are mad for a bit of Pop Culture here at Mister Slipper so we thought we would list some of our favourite pairs with all their subtle nuances. We love The Simpsons. Its been going for over 20 years and it shows no sign of stopping. They are most instantly recognisable characters on the planet and it is only fitting that they appear on one of thew worlds most recognisable shoes. There are loads of different pairs out there but the classic “Chalkboard” gag has to our favourite. Its at the start of every episode and now it can be on your feet. Pink Floyd are one of our favourite bands ever and with such iconic album art work it makes perfect sense to make them into a pair of converse sneakers. We’ll have our eyes out for a pair of jet black “Dark Side of the Moon” trainers but for now these “Wish You Were Here” ones will do just fine. Speaking of bands. Check out this pair of Black Sabbath Hi Tops. The album art comes from their first record and we love them. Would be great to see a pair featuring the famous “Volume 4” artwork but this is just as good. We have a soft spot for all the comic book trainers that are out there. We’ve seen some great pairs featuring the likes of The Flash, The Avengers, Batman, Harley Quinn, Joker and many more but we’ve always lover Superman. These Man of Steel trainers look great. More band…I know, I know but its AC/DC! 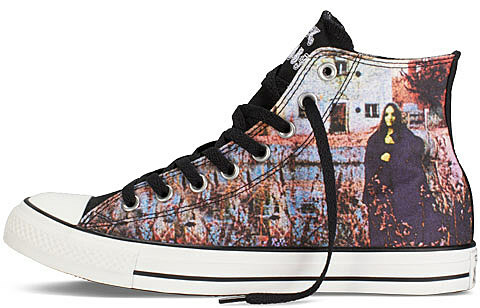 The classic album cover for Highway to Hell has been immortalised in Converse format. 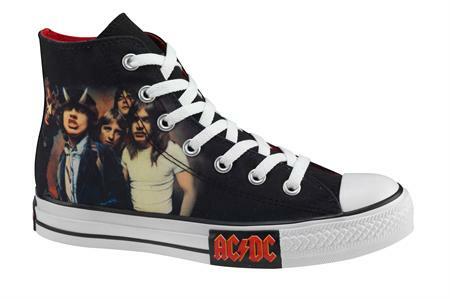 We’re huge AC/DC fans so we might be being a little bit biased but these are the best pair of Converse int he world.